Like we told you before so are we living at MacEwan’s Residence, which is located at the campus. It’s really easy when it comes to getting to class (just takes a couple of minutes) and very convenient to get home and make your own lunch and dinner. After all we are in North America and their food as you probably know is not famous for the healthiness. So we try to make as much as we can by ourselves. We are a little limited then we don’t have any oven and just a stove, but so far we have survived. As most of you might know, the biggest difference between studying in Canada than Sweden is that we take all of our courses during a semester at the same time. This could sound really hard, but actually it’s a little bit like going back to the gymnasium so far. The biggest problem will probably be to have time for all the group works that we have in each course (they do love group works here at MacEwan). With different group members that all have different schedules! We’ll se during the term how this works out. Anyway, thought that we could tell you a little bit about the courses we’re taking. We are taking the same courses but we are not having the same schedule, which it’s nice in case we will get tired of each other. Business communications. It is what you probably think it is. How you communicate in a business environment and how the Canadians assume that you should behave. What way is the best way to contact people and all those things. So far a lot of it is just common sense but I think that this course will become very handy sometimes when you are in a workplace. And of course, it is kind of an English class, which is really good to improve our English, especially in writing. Introduction to Canadian business. Well, in the first class we discussed whether you should answer your phone or not when you are having a conversation to someone and are receiving a call. Also whether you should have your ringtone turned on or not, and what kind of ringtone and so on. I got surprised how much you actually can discuss this… But the course is about introduction to business, and we have a group project where we are supposed to gather in money, basically the one with the most money gets the best grade if I translate directly what the teacher said. Project management. The most passionate teacher I’ve ever seen (and the tallest Asian, for sure). But still so… I don’t know. Yesterday he had a 20 minutes tutorial about how we download the software we will be using for the group assignment. No further comments about that. International marketing. Marketing as it is but in a very Canadian perspective and how Canada place itself on the world map. Will probably be the most interesting course this fall! Diversity and intercultural communication. A lot of discussions about differences between cultures and behavior. Most of it is common sense, but it’s really interesting to see how Canadian are thinking and how to see it through their perspective. The teacher, an old woman, is great. She does love Japan so that culture returns occasionally. I have even learned a couple of sentences in Japanese. 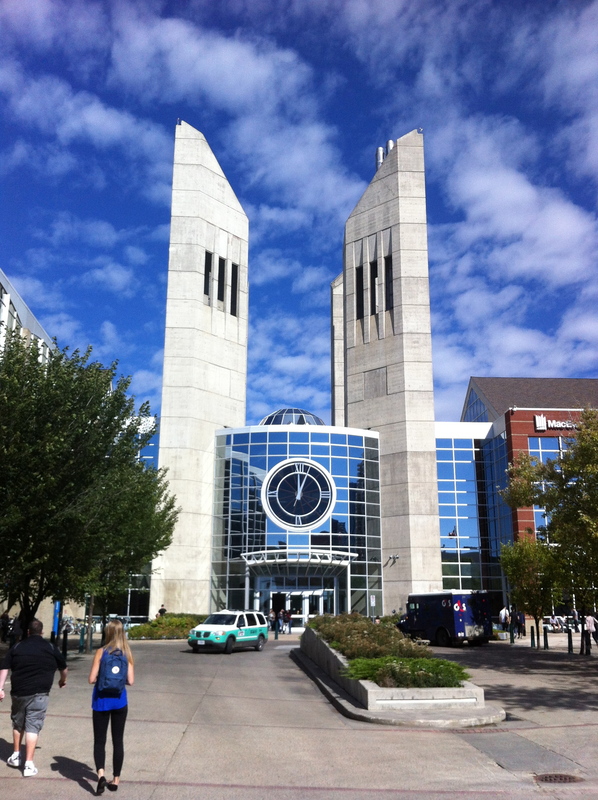 This entry was posted on Wednesday, September 25th, 2013 at 03:55	and tagged with Canada, Umeå School of Business and Economics (USBE) and posted in Grant MacEwan University. You can follow any responses to this entry through the RSS 2.0 feed.